I have always had a love/hate relationship with bathing suits because of my feelings about my scar from pyloric stenosis surgery. In my family, I was taught to feel ashamed of my scar. 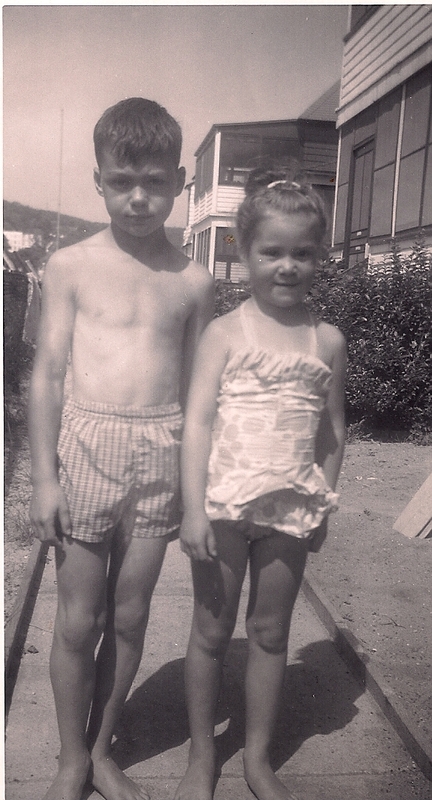 Here’s a photo of me standing next to my brother at Sandy Hook, New Jersey. I am wearing what I think of as the dangerous suit. Since the straps tied behind the neck, I was always worried about them coming loose. Once while swimming in the Atlantic Ocean, the top of the suit literally flopped forward from the waist up, exposing my scar! I quickly submerged myself to my chin and re-tied my straps, double knotting the bow. My scar was ugly and I wanted to stay cute. When that bathing suit wore out, I bid it good riddance. In this photo, I wear my black tank suit, as it was called. Why it was called a tank suit, I don’t know, but I did think of it as protection. This suit was stretchy and the straps didn’t need to be tied. See those three white discs on my chest? The buttons were big and clown-like. Just beneath them and a little to my right sat the pyloric stenosis scar. To me, the buttons and I had a secret; we knew the scar was underneath but no one else did. We fooled everyone. I felt powerful. I wonder what it would have been like if my brother had been the one with the stomach scar. He certainly would not have been able to hide it during swimsuit season; it would have been much harder for him. One thing’s for sure–parents can help kids accept and befriend their scars. They can help them see their scars as marks of power and survival. Scars can show how strong one is and how good one is at healing. Scars can also be cool. I remember reading a scene in a memoir in which a little girl pulls up her dress at her birthday party to show off her cancer surgery scar. The kids oooh and ahhh. One child actually says that he wishes he could get one! She lowers her dress, and they all go back to batting balloons around the room. You bet her parents had everything to do with her ability to accept her scar. Luckily, my illness was cured unlike hers. But she inspires me to one day be able to feel pride about my scar. Scar Pride! Would make a cool T-shirt. Thanks for responding to some of my recent posts like you have, Wendy. I feel honored and supported by your sharing something of your story of this sensitive issue. 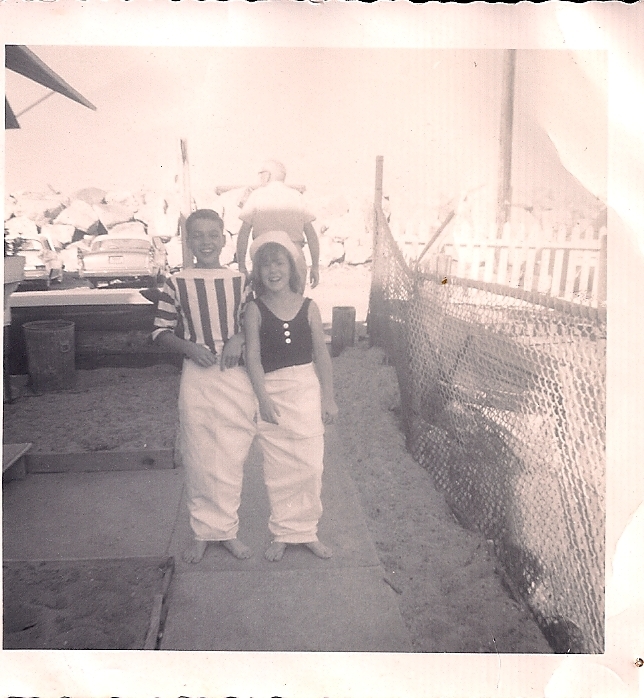 Your description of how you managed your shame as a child is very similar to mine, and in a long-ago post I also included a photo of the special swimsuit I once had: my mother made it (yes, mothers often made their kids’ clothes then!) specially to cover up my ps scar. I also wrote about the embarrassing lengths I went to to cover up when I had to start wearing normal boy shorts to the pool and beach. You are so right emphasizing the crucial role of parents in helping scarred children own their deep feelings and manage what was (for some or many of us) a very threatening world. You are my scar buddy in the best sense of the word. If you can look so relaxed in your blog photo, exposing your midriff, maybe I can too, one day. Thanks for your dedication to this issue and for your friendship. on August 28, 2012 at 11:14 am | Reply C.H. Wow! These are such awesome and interesting photos of you and your brother. I remembered when I was in your class, you talked about your brother a little bit. Thank you. I’m sorry to say that he died in Nov. of 2010. HIs birthday is this week; he would have been 63. He had his share of health issues too when he was a little guy. I miss him.